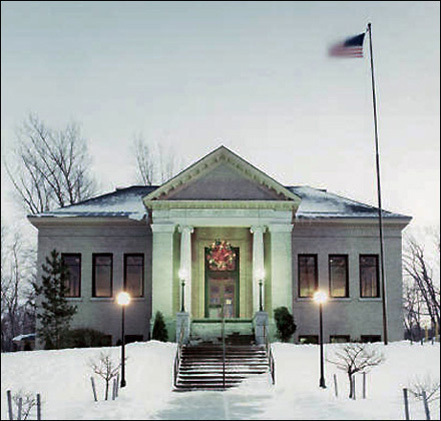 I don't think there's any doubt the building that has meant more to more Solvay residents than any other is the public library at the corner of Woods and Orchard roads. The photo below was taken in Demember 1979; the front entance is decorated for Christmas. For years my sister and I ran a shuttle service to and from the library, picking up, then returning books for my mother, who also made many such trips on her own. My thanks to the library staff who went out of their way to provide my mother with their latest additions and books my mother had requested. My mother went through books the way some folks go through potato chips. She must have read every novel the library had, several of them more than once. During my teens the library basement was the site of Teen Town, weekly party-like gatherings for local kids. It was a great meeting place and a wonderful Saturday night option. Plans for the Solvay library, donated to the village by Andrew Carnegie and Frederick R. Hazard, have been completed. The library is to be erected at Orchard and Woods roads, on a lot donated by Frederick R. Hazard. The building is to be classical in design, 72 by 66-1/3 feet and one story in height The front steps and buttresses will be of Gouverneur marble, the rest of the stone work Indiana buff limestone. The building will be chiefly of gray pressed brick, with the roof of black slate. A large vestibule leads from the entrance to the delivery lobby. Here there will be a large octagonal delivery desk for the use of the librarian. There will be turnstiles on either side of this desk so that persons entering or leaving will come immediately under the notice of the librarian. There will be a general reading room at the right and a juvenile room of the same dimensions to the left. These rooms will be 23-3/4 by 30. Mr. Carnegie an Mr. Hazard each contributed $10,000 toward the erection of the building and the Solvay Process company will contribute $500 annually for its maintenance. 1. The library plans were prepared by an architectural company called Merrick & Randall. 2. The library basement would have an auditorium seating 200 people. 3. The entire building would be handsomely finished in white quartered oak. 4. Thomas Maloney, mason, and Huber Brothers, carpenters, are constructing the building under the direction of James A. Randall. In a Post-Standard story on October 27, 1904, it said the trustees of the library announced the building would be finished by January 1, 1905. From left to right, Mrs. Virginia Prucker, clerk; Miss Miriam E Oaks, librarian; Miss Judy May Young, page, and Mrs. Mildred S Donohue, clerk. Miss E. Joyce Young, page, was absent when this photograph was taken for Village of Solvay Annual Report, which announced that Mrs. Elizabeth F. Hardy had been engaged to serve in the library's new children's department.